Hello Everyone, It's soft and sweet in the Secret Garden today. I was able to clean, prune and plant. I'm studying the " The Ultimate ROSE Book" for more ideas. 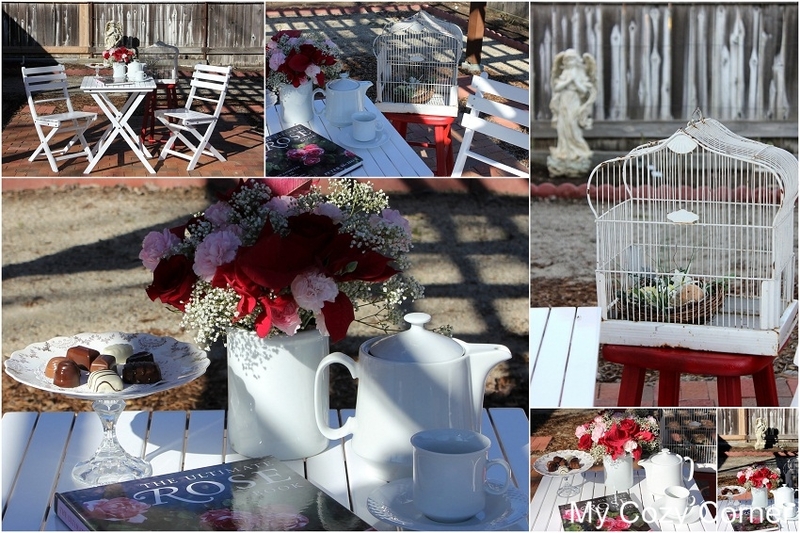 A vintage bird cage with a bird's nest is setting the mood for Spring~And a newly painted red stool. The angel is watching over the progress of the garden. A few candies from my Valentine (Sweetheart) and a pot of tea. You are going to love this! I was wondering where you lived that you could be working on a garden this time of year. Your prep work is looking really lovely! I hope you link this up to "Open House" here on Thursday! Oh, what a sweet spot to sit out and enjoy your garden and some refreshments. I cannot imagine being able to work out in the garden this time of year. I'm envious! We are getting storm after storm here lately; snow storms! I love the Island but I am not loving the wintertime. I am looking forward to seeing all your beautiful blooms shortly. Thanks for coming to tea and enjoy that pergola! Beautiful tea table and such inspiration. I pictured each step with your lovely descriptions. What a nice place to relax, you will certainly enjoy this during warmer weather. I am anxious for spring to get here. This is going to be absolutely amazing when the garden matures - how delightful. I love your made it all pretty with a little tea party, inspirational garden book and assorted pretties to make you comfy - just lovely!! I ADORE your shabby birdcage with nest. So fresh and beautiful! It is still too cold where I live, so I will have to enjoy it through you! Hope you can stop by the enchanted oven to say hi. Oh so pretty--and I usually don't like red...but that is a beautiful red! Oh lucky you, Our weather is just a bit too cold to enjoy sitting out quite yet. Hot tea and chocolate with a wonderful book of roses sounds like a perfect way to spend an afternoon!! I see your secret garden was long work in progress. It already looks so cozy. To think it wasn’t finished at the time of this post. Anyway, I assume those roses are from your flowerbeds. I would love to see how they look like now!